Ever wonder what happens if an Actor in a musical gets sick? Who fills their shoes? Have you been cast as a Swing and don't know where to start? Do you dream of being a Broadway Actor? This book is for you!!! 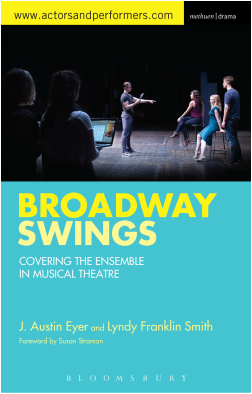 In this textbook for performers, the position of a Swing (an Understudy for the Ensemble) on Broadway is examined from every angle, showing just how vital Swings are to the success of any musical theatre production. Authors J. Austin Eyer and Lyndy Franklin Smith draw on their own experiences as performers, and gather first-hand stories from other Swings about the glories and hardships of their industry. The book features interviews with over 100 Broadway pros- Swing veterans, Stage Managers, Casting Directors, Choreographers, and Directors- including Rob Ashford, Susan Stroman, Jerry Mitchell, Larry Fuller, Tony Stevens, Beverley Randolph, and Frank DiLella. Broadway Swings is the ideal guide for anyone considering a career in this most unique of positions, or anyone curious about what really goes on, behind-the- scenes, in a long-running show. Chapter 1- What is a Swing? Chapter 6- And the Show Goes On . . . and On . . . and On . . .
Chapter 8- So you Think you Can Swing?